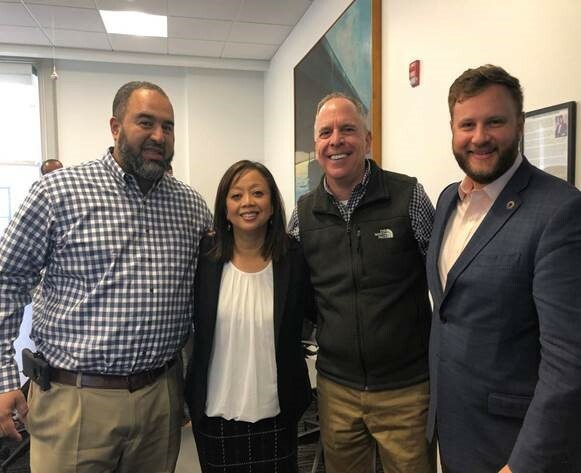 HRiA, in collaboration with the Massachusetts Public Health Association (MPHA), co-hosted an informational breakfast with State Senator Julian Cyr, a key public health ally in the Massachusetts State Senate. The breakfast session gave leaders from public and private institutions an opportunity to share their top public health priorities with the senator, in his second term representing Cape Cod and the islands. Senator Cyr serves as the Chair of the Joint Committee on Mental Health, Substance Use and Recovery; as Vice Chair of the Joint Committee on housing; and as Assistant Majority Whip. The group raised a variety of timely topics – issues that are experienced not only in Massachusetts, but across the United States as well. Participants discussed lead poisoning prevention, violence and trauma, substance use disorders, mental health, and local public health infrastructure. Thank you to those who brought their knowledge and expertise to the event: Monica Valdes Lupi, Executive Director, Boston Public Health Commission; Carlene Pavlos, Executive Director, and Maddie Ribble, Director of Public Policy and Campaign Strategy, and Jodie Silverman, Board President, MPHA; Nineequa Blanding, Director of Health and Wellness, The Boston Foundation; Michael Curry, Senior Vice President, Government Affairs & Public Policy, General Counsel, Massachusetts League of Community Health Centers; Danna Mauch, President and Chief Executive Officer, Massachusetts Association of Mental Health; Nate Horwitz-Willis, Director, Plymouth Health Department; Dan McCarthy, Government Relations Coordinator, Greater Boston Food Bank; Kim Blakemore, Program Officer, Tufts Health Plan Foundation; and Mo Barbosa, Director, Community Engagement, Heather Nelson, Managing Director, Research and Evaluation, Lisa Wolff, Vice President, and Steve Ridini, President and Chief Executive Officer, all of HRiA. HRiA also extends special thanks to Senator Julian Cyr for his time and attention, and to MPHA for co-hosting the breakfast.